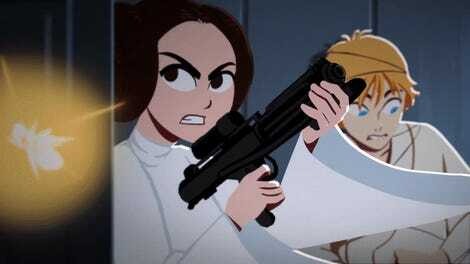 An early animatic of the first teaser for Galaxy of Adventures. 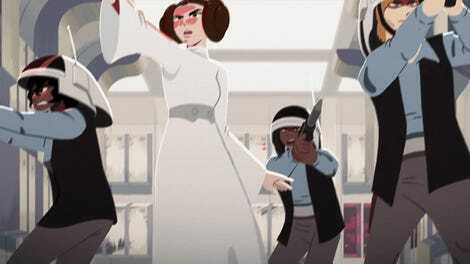 Another short in the series was released today, (you can see it below), and to celebrate, io9 chatted with animation director Barry Kelly to learn more about the process of how the Galaxy of Adventures series gets made, from deciding where in the saga to pull from, how and when to tweak familiar moments, and the need for humor in the galaxy far, far away. 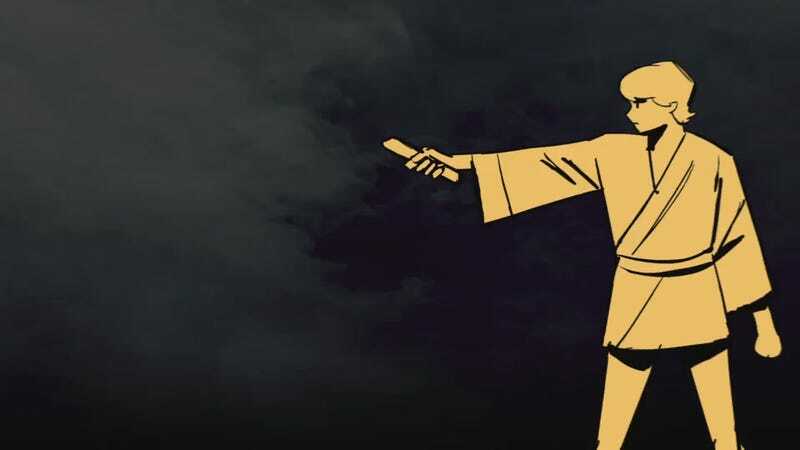 Check out our complete interview below, as well as some galleries of never-before-seen concept art and storyboards from the series! Through my work on Galaxy of Adventures, I’m trying to capture the feeling of important Star Wars moments I had as a kid. I was born in 1984 after the originals were in the theaters, so my first time seeing the movies were on the VHS tapes my brother and sister recorded from TV. I inherited my older brother Bryan’s fandom, along with his action figures. Then Power of the Force figures came out and I found myself playing X-Wing vs. Tie Fighter, then reading the novels and comic books, and it went on from there. Every other medium kept Star Wars alive for me beyond the original trilogy. LucasArts games were an important part of my childhood, which showed me how you can translate stories to other mediums. Galaxy of Adventures is an idealized version of the characters and memorable scenes. It’s playing with the world while honoring them for the inspiration that they are. I just knew what these shorts needed to be and knew we had the right crew at Titmouse to make them. And a final expressions whirl, this time for everyone’s favorite scruffy lookin’ nerf herder. In this case, it’s surviving someone as relentless and powerful as Vader. This is literally my favorite scene in all of Star Wars—how do I not ruin it for myself as a fan? Luke was quite the acrobat in the OG trilogy, he leaps around [and] flips over Vader, and we can use that. The prequels cranked Jedi combat up with a lot of energy and speed, so I felt that justifies room to explore the scope of action because the films did that. We could show the contrast between how Luke and Vader fight. Vader with fast, direct, strong blows against Luke’s evasive, quick-footedness. 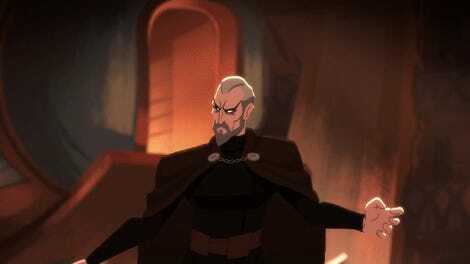 Yoda and Dooku face off in what is currently the only prequel-era short in the series (so far). io9: There’s been some discussion around the shorts about the level of humor they bring to the Star Wars galaxy. Can you speak a little on injecting a lighter tone into the scenes you end up adapting? Was it important for the team to specifically highlight the funnier side of the films? It’s that kind of contrast that makes these scenes lovable, and that kind of contrast really inspires the fun side of these shorts. One minute Han is the hero saving the day, the next he’s trying to talk his way out of a bad bet. I like the idea of a hopeful, bright-eyed Luke on his first day off his home planet trying to rescue a princess who has way more combat experience. The Star Wars movies are funny, dramatic, scary—they’re everything. They’re first and foremost fun, but fun with real stakes. They are about growing up, learning, and facing fear.